With Sunday 11th November 2018 being the 100th Anniversary of the signing of the Armistice at the end of WW1, there were extra events going on around Pakefield Cliffs! 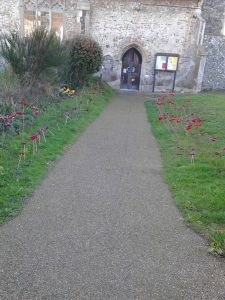 As folk arrived for our services in the morning they were greeted by poppies along the path into the church, made by the members of 1st Pakefield Guide Company. 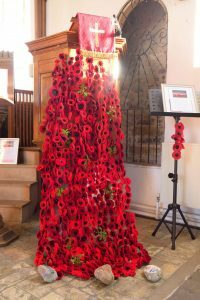 To represent each year since the Armastice they hade made 100 poppies from recycled plastics and they looked fantastic! Inside the church many people had spent many hours crafting poppies to make a waterfall effect down from our pulpit – beautiful! The 10.30am service was attended by a many beavers, cubs, scouts, brownies and guides as well as our usual congregation. The 2 minutes silence was observed at 11.00am and at the end of the service we moved outside for a final act of remembrance around our WW1 War memorial commemorating those who had lost their lives serving in the Army and the Navy. Our evening service was at the later time of 6.30pm this week and was a Time of Reflection attended by over 200 folk. 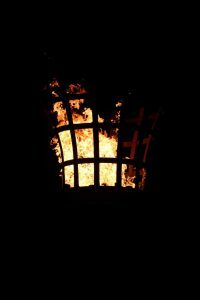 The congregation moved outside onto the cliff top to be joined by many others as the Bell ringers started ringing and the Beacon was lit at 7pm,joining in with hundreds across the country. There then followed readings, poems and song from WW1 plus the reading out of each of those named on the War Memorial by members of the crowd. Everyone was then invited to gather inside the Trowel and Hammer for refreshments.